Jardine's Steak Seasoning 11.5 oz. BBQ → D.L. 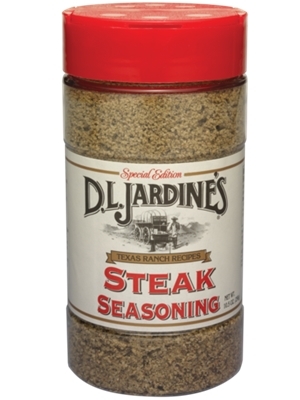 Jardine's Steak Seasoning 11.5 oz. Making a mouth-watering steak is as easy as sprinkling Jardine's Steak Seasoning on both sides about 20 minutes before cooking, then grilling to your liking. Also adds great flavor to chicken, pork, brisket, ribs and burgers. Salt, black pepper, granulated garlic, spices, dehydrated celery, and worcestershire powder (may contain sulfites, wheat, soy and fish ingredients). Also great to save a bland meatloaf. This is my FAVORITE steak seasoning. I use it on the Grill, Skillet on shrimp stir fry, and in my Beef Stew recipe. LOVE IT ! ! ! !